4th March 2006 - "The Ho" came fitted with Douglas "Performance GT" road tyres and needed replacing with something a bit more rugged. Getting off-road tyres for "The Ho" wasn't the easiest of jobs. There are no good used ones around here. 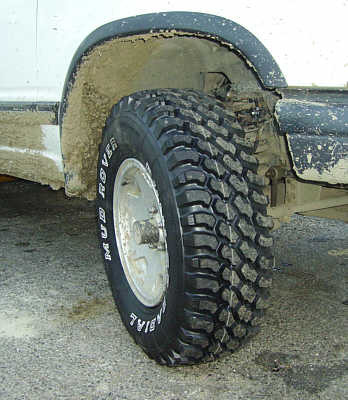 Off-road tyres are expensive and so get driven on till there's nothing left of them. We phoned every tyre dealer in the area and had quotes from $535 to $650 for four tyres. In the end we got 4 31 x 10.50 x R15 Dunlop Radial Mud Rovers from Rural King. They were having a "4 for the price of 3" sale and so the set of four cost a couple of cents over $400 which included fitting and balancing. Unfortunately the fitter said they'd rub so back to Andy's garage for a few modifications. There are a couple of ways of lifting a car by a couple of inches. There's a body lift, which raises the body off the chassis. 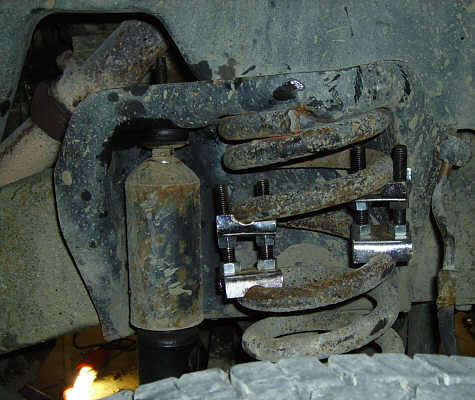 A suspension lift is better and involves changing the springs and shock absorbers so the whole car sits higher of the ground and then there's the really cheap way of doing it which is by using spring spacers which is what we did. Spring Spacers are clamps that can force a section of spring to expand or compress. Getting these to fit in "The Ho" looked like it might cost Andy and I a couple of fingers each. 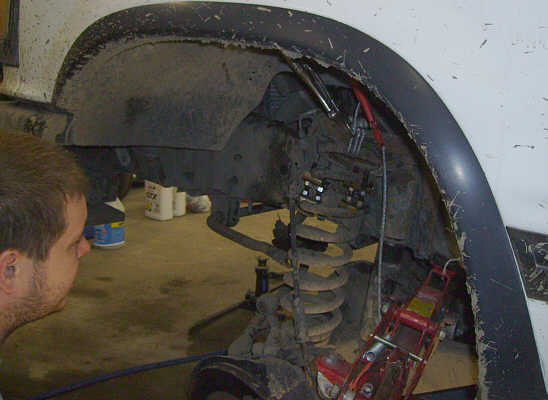 The car is jacked up and the wheel removed. We wrapped wire around the top of the spring and its seating and clamped the whole thing in place. This is to prevent the spring from coming out of its supports when we placed a second jack in the suspension to lift the body from the suspension. Using a piece of 1.25 diameter thick walled steel tube as a lever we forced a section of the spring apart to get the spring spacers in. The tensions involved are pretty big and we'd already broken a couple of C clamps in an earlier attempt. We lifted the front of the car just over two inches using these devices. 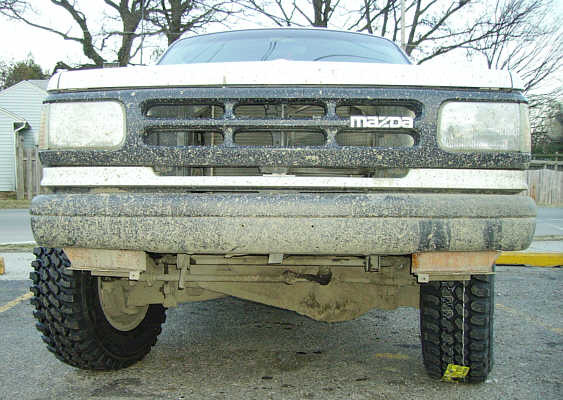 The ground clearance for the 1992 Mazda Navajo was 6.7" with standard 26" tyres. The new tyres, although specified as 31" are in actuality just over 30" in diameter so the ground clearance should be now around 8.7" That wasn't a bad guestimate when I measured it from the bottom of the front diff ground clearance is around 8.5", from the bottom of the back diff the ground clearance is 8.25"
26" x 3.1416 = 81.682" of travel per rev. 63,360" per mile / 81.682" = 775.691 revs per mile. 30" x 3.1416 = 94.248" of travel per rev. 63,360" per mile / 94.248" = 672.269 revs per mile.